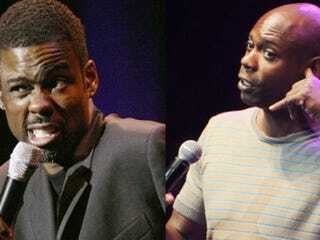 Chris Rock and Dave Chappelle to Tour? Assuming he wasn't kidding in a conversation with Vulture at the Sundance Film Festival, Chris Rock is still pushing for a once-rumored stand-up tour with Dave Chappelle — one that he thinks could be the comedy equivalent of Watch the Throne. We're laughing just thinking about it. During a chat with Vulture about his movie 2 Days In New York (which will run in full on Thursday), Rock briefly talked about to us about his upcoming projects, and while he didn't have much to say about his role in the omnibus comedy What To Expect When You're Expecting ("Yeah, that's coming out"), he's pretty excited to go out on tour. "I've been talking to Chappelle a lot. Been trying to get Chappelle to go on tour," he told us. Those reports had surfaced briefly in October, but we'd heard nothing since then; is Rock really going to make this a reality? "You know I'm not the hard one," he said, laughing. "But I'm trying to make that happen. After seeing Kanye and Jay-Z, I was like, 'Me and Dave should do this.'"